Based on the energy-related provisions of the 2012 International Green Construction Code (IgCC) with significant Oregon amendments. The 2011 Oregon Commercial Reach Code (OCRC) became available for use July 1, 2011. The 2014 ORSC was developed as a minor update to the 2011 edition. Based on the International Green Construction Code (IgCC) public version 2.0. This code became effective October 1, 2011. Oregon code update cycles generally follow one year behind the three-year International Code Council model code update cycle. The 2014 Oregon Residential Specialty Code (ORSC) becomes effective. The 2014 Oregon Energy Efficiency Specialty Code (OEESC) becomes effective. The 2011 Oregon Residential Reach Code (ORRC), incorporating energy-related provisions of the 2012 International Green Construction Code (IgCC) Version 2.0 with significant Oregon amendments, becomes effective. Following a May 13 rulemaking notice, BCD updates the state’s residential code from the 2008 ORSC to the 2011 Oregon Residential Specialty Code (ORSC); these requirements are identical to Chapter 4 of the 2010 OEESC. BCD believes the average home built under this code will be more efficient than a home built to comply with the 2009 IECC. There is a 90-day phase in period through October 1, 2011. Around 15% energy savings beyond the previous Oregon commercial requirements by making changes in three main areas: requiring increased insulation and energy-efficient windows, adding automatic lighting controls, and requiring more efficient mechanical systems. Reach codes: As directed by SB 79, the optional reach code encompasses construction methods and technology designed to increase energy efficiency over the mandatory codes for builders that choose to incorporate them. The Oregon Commercial Reach Code, available for use starting July 1, incorporates energy-related provisions of the 2012 International Green Construction Code (IgCC) Version 2.0 with significant Oregon amendments. 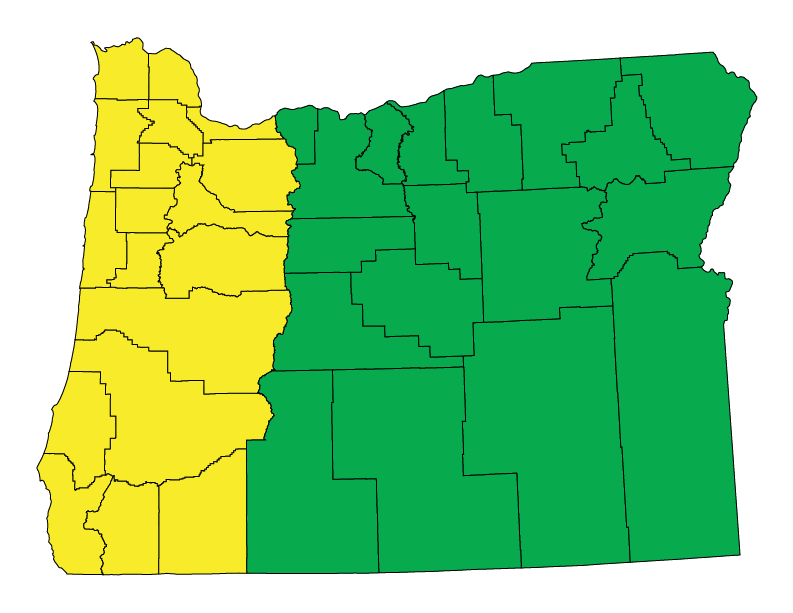 The 2010 Oregon Energy Efficiency Specialty Code (OEESC) replaces the state’s previous energy provisions for commercial construction (the 2007 OSSC). The 2010 OEESC is based on the 2009 IECC with strengthening Oregon amendments. There is a 90-day phase-in period through October 1, 2010. The Oregon Building Codes Division (BCD) begins accepting state building code amendment proposals relating to construction practice or methods related to energy efficiency for possible adoption in Oregon’s first Reach Code as authorized by Senate Bill 79. BCD has identified the 2012 International Green Construction Code Version (IgCC) 1.0 as the model document for this code. The Oregon Legislature approves Senate Bill 79, directing the Oregon Building Codes Division (BCD) to increase energy efficiency in buildings that are newly constructed, reconstructed, altered or repaired. SB 79 requires the Oregon BCD to improve the state’s building energy codes by 10-15% above existing residential requirements and 15-25% above existing commercial requirements. The Building Codes Structures Board reviews code change proposals and amendments to the 2009 IECC requirements for the building envelope, lighting, and mechanical systems. In addition to increasing efficiency in the statewide mandatory energy code, Senate Bill 79 establishes a new code called the Reach Code. The Reach Code is a set of statewide optional construction standards for energy efficiency that exceed the requirements of the state’s mandatory codes. The Reach Code covers a variety of topics including: mechanical systems, lighting designs, overall building design (both residential and commercial), plumbing practices and products. BCD works align the code with federal, state, and local financial incentives. The Oregon Building Codes Division (BCD) gives final approval to the 2008 ORSC, effective July 1, 2008 after a three month interim period. This code is based on the 2006 IRC. The energy requirements in Chapter 11 reduce energy consumption in new homes by 15% versus the previous 2005 ORSC edition. Many, but not all, of the measures of the 2008 ORSC are drawn from the 2004 Northwest ENERGY STAR specifications. With the adoption of the 2008 ORSC, it is decided to move the respective Low Rise Code requirements into the adopted model codes with which they most closely align. This allows Oregon’s published codes to be consistent with the scope of the nationally promulgated codes and assists in the scope of inspector/plan review certifications and certain licensing requirements. The Oregon BCD Enforcement Program works with local jurisdictions so they can emphasize proper compliance with permits. It has implemented pilot enforcement programs across the state to test different enforcement models and has expanded the division’s enforcement presence in local communities. Non-residential buildings are henceforth subject to the 2007 Oregon Structural Specialty Code (OSSC). Chapter 13, covering building energy efficiency, is been certified by the U.S. Green Building Council (USGBC) and is 1-2% more stringent than ASHRAE 90.1-2004. Governor Ted Kulongoski mandates that the state of Oregon improve energy performance in new residential construction by 15% by the year 2015. The successor to the Low Rise Code, the 2005 Oregon Residential Specialty Code, is published and adopted. This code is based on the 2003 IECC. Slight revisions to the 2004 Oregon Structural Specialty Code (OSSC) include significant changes to the Air Transport Factor requirements and calculations. There are also slight revisions with significant increases in deemed-to-comply-with window traits for window wall components. Senate Bill 906 passes in the 2003 Oregon Legislature and is codified in Oregon Revised Statute 455.040, creating Oregon’s Low Rise Residential Dwelling Code (Low Rise Code). This bill also creates the Residential Structures Board and assignes it purview of the Low Rise Code. Read more about the history of the Low Rise Code here. Equipment efficiency tables are updated to reflect ASHRAE 90.1-1999 but using ASHRAE 90.1-2001 values. A complete non-residential energy code is first adopted in 1996. In 1998, slight revisions are made, not including envelope or lighting components. In 1999, a high glazing path is added with significantly improved window requirements so that overall thermal integrity is not compromised. Oregon adopts a state-promulgated non-residential energy code applying only to the building envelope. This code is expanded to include HVAC systems in 1980.